New Yorker Russell Johnson (1924-2007) was responsible for the acoustics. 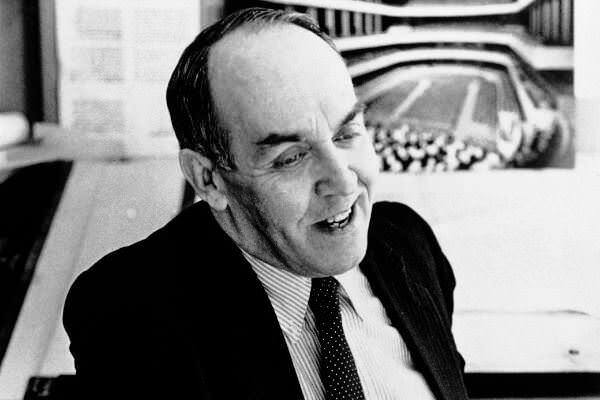 For more than three decades he carried out projects around the world with his artec-Gruppe (artec = art and technology) and was regarded as one of the leading professional acousticians. 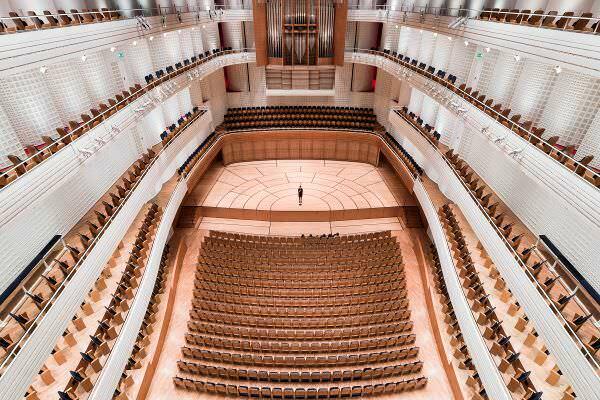 Despite all the fame, the KKL Luzern was a milestone for him: 'The Lucerne Hall is the descendant of 40 to 50 predecessors that I've built since 1956. Almost all my work achievements are grouped together in this'.The aim was to create an acoustic that best brings to life the entire musical repertoire, from the middle ages to modern sounds. The optimum acoustics are achieved by the height, width and length being in a 1:1:2 ratio. This is all about the time-tested «shoebox» principle. 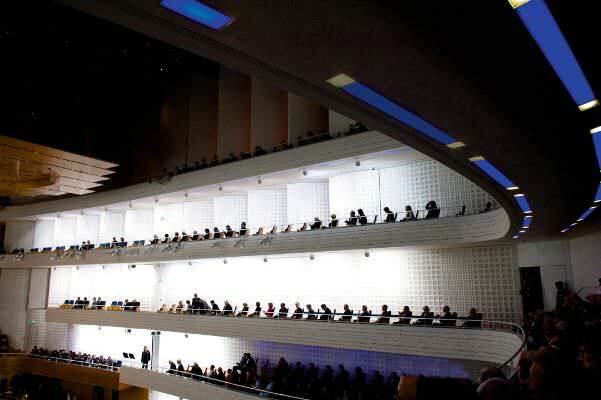 In the case of the Concert Hall, these are 22m – 22m – 46 m. The large 19,000 m3 dimensions of the Hall gives enough space and creates a soft, round finish. A further acoustic element is the approximately 24,000 square plaster reliefs that are each 20cm in length. The textured plastered surfaces break the reflection of the sound, multiplying it and distributing it in all directions. 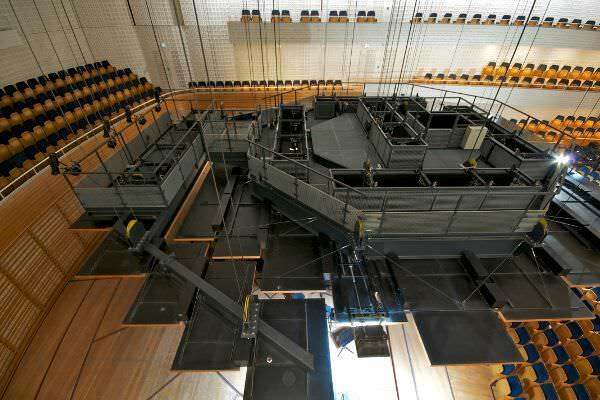 The Echo chamber is a large, connected, hollow space that surrounds the Concert Hall in its upper echelons. It opens by way of 50 electronically controllable concrete doors. By making use of it, the volume of the Hall can be increased by 6,000m3 from 19,000m3. Through opening the doors to different extents, the sound can be varied and the reverberation time adjusted and extended by up to 3 seconds. Further regulation of the reverberation time is made possible by the use of curtains. If the reflective zones are evenly covered, the reverberation time will be reduced and the acoustics will dry out. This property is required when spoken word events, jazz and pop concerts take place. The acoustic canopy is located above the stage. This is a two-part sound reflector, which is adjustable in height. It enables musicians to hear things without a sound delay, and the sound travels much faster throughout the Hall. These settings allow the acoustics to be adjusted for each individual work. In this way, the sound image that corresponds to the original conception of the composer can be reproduced. For chamber music concerts or when the Hall is not completely full, the canopy is set lower down to create a more intimate space. For extremely large formations and when the organ is in use, it can be raised to directly underneath the ceiling. 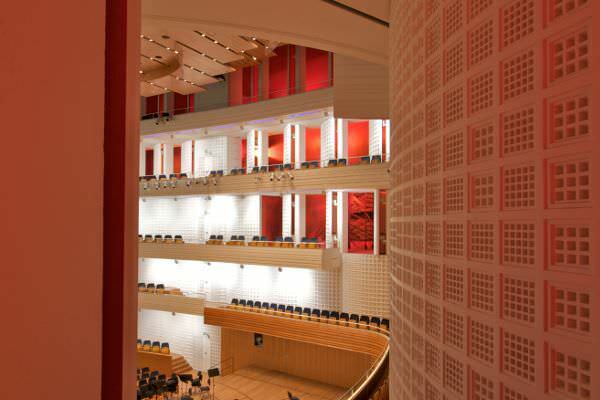 In the Concert Hall, the largest part of the sound energy interacts with the walls. It is then thrown back sideways to the listener as venue sound. This effect is used optimally by the four side galleries. In a reflective space like the Concert Hall, the venue sound has the same intensity everywhere. 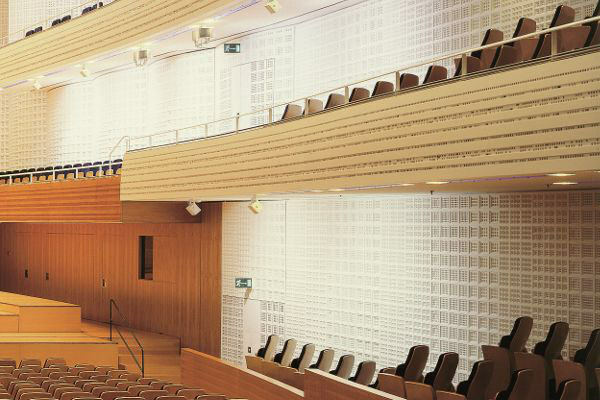 This uniformity creates a spatial impression, which is one of the most important subjective aspects of the acoustic quality. The noise level in the Concert Hall is set at 18 decibels. This volume is not audible within the normal frequency range of human hearing. Both the ventilation and lighting installations of the Hall are virtually inaudible during concerts. Also, any entrances into the Hall are sealed with soundproof, heavy doors. The Concert Hall can be described inside as absolutely still. This property provides a perception of the music in its entire dynamic – from the lowest pianissimo to the deafening fortissimo.